Unveiled at Selfridges’ Corner Shop last week, and running until 3 June, the bespoke London installation curated by The Rolling Stones and Bravado takes over four Selfridges shop windows and includes a display of hand-picked selections of the band’s iconic stage outfits through the years, with the opportunity to shop the collaborations with premium brands’ exclusive and limited-edition pieces. The shopping experience sees Selfridges and Bravado give the iconic red Rolling Stones tongue a makeover with a new range of ‘Yellow Label’ apparel. Fans can pre-order the band’s first ever vinyl box set, shop official No Filter tour merchandise and relive The Stones’ historic Cuba concert on screens and via in-store headphones. 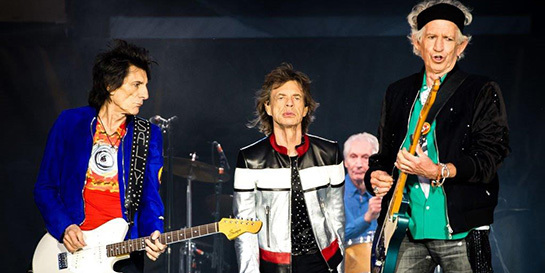 The Stones’ highly anticipated the first leg of the UK No Filter tour kicked off last week in Dublin and were back on the road from last night at the London Stadium, going on to Southampton, Coventry, Manchester and Cardiff, before finishing back up again at London's Twickenham Stadium. The shows will be accompanied by a selection of stellar supporting acts, including Liam Gallagher, Elbow, The Vaccines, Florence + the Machine and James Bay.